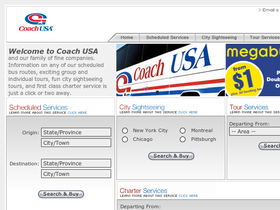 Coach USA, online at CoachUSA.com, is your destination for bus travel. At Coach USA, you can book bus trips, learn about tours, and book charter services. You can also book city sightseeing trips to cities including: New York, Pittsburgh, Montreal, and Chicago at Coach USA. There is also a link to Megabus.com, an inexpensive, daily express bus service to and from New York at Coach USA. You can also book airport transportation at Coach USA. RetailSteal.com has the best Coach USA coupon codes, Coach USA discounts, Coach USA coupons, and Coach USA promo codes. Shipping and handling rates do not apply to Coach USA. See website for full details. At Coach USA, book travel for as low as $1 plus a reservation fee. At Coach USA, save 20% on Chicago's Trolley Tour when you book it for 15 or more people. Click link to save. At Coach USA, get 10% off when you book a Chicago trolley. Click link to save. Get 5% off Lenzner Tours when you book at Coach USA. Click link for savings. Be a part of the $1000 seat give away when you use this coupon code. Click to start saving. Check out Coach USA for $1 tickets from Philadelphia to Washington D.C. Click here. Enjoy free Wi-Fi while traveling on Coach USA. Click link to book your trip. Enjoy a Chicago tour from Coach USA, only $31.50. Click link to explore. At Coach USA, New Yorkers can enjoy trips to the popular Woodbury Common Premium Outlets. Click link to buy tickets.